Selecting an asphalt contractor to perform work on your property may not be a responsibility that you deal with on a daily basis. If all asphalt companies provided the same quality of work, showed the same respect for their customers’ property and dealt with every customer in an honorable manner, you could simply choose the contractor quoting the lowest price. Unfortunately, not all contractors behave honorably, so you must perform your due diligence to ensure that you researching trusted asphalt companies. There are several tools that you can use to discover a potential contractor’s reputation. You can ask him to provide recent references and then contact them to ask about the quality of his work. You can contact the Better Business Bureau to learn how the contractor has dealt with any complaints. You can search online forums and social media for comments related to the contractor’s professional services. Use whatever tools you can to learn whether the contractor has a reputation for providing quality work, adhering to schedule and offering the level of customer service that you require. You will want to make sure that you are protected should an accident happen on your property. Your contractor should have a general liability policy as well as vehicle liability insurance. Furthermore, all of his crew members who will be working on your property should be covered by the contractor’s workers’ compensation policy. Ask for proof of insurance and verify that the policies are still in effect. Poorly maintained equipment can break down in the middle of the job, delaying the completion of your work. Even worse, if the contractor does not have the right equipment for the job, substitute methods could be employed that would lead to inferior results. The contractor may have decades of experience, but his crew must also be experienced and adequately trained. Ideally, every member of his crew will have years of experience, but at minimum, the employee supervising your project should be highly experienced and on your site throughout the project. Ask how long employees have worked for the contractor; low retention rates can indicate unhappy employees, and unhappy employees may be less productive or less committed to delivering quality work. At Asphalt Pavement Solutions, we understand that you have questions, and we are more than happy to answer them. Since 1983, our asphalt sealcoating company that has been committed to delivering the best quality possible and offering exceptional customer service. 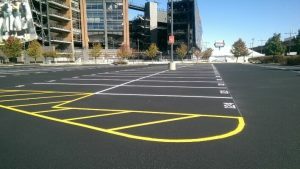 Whether you need sealcoating, asphalt paving, asphalt repairs, parking lot striping or another asphalt-related service, you can count on us to arrive when scheduled and to deliver a quality job. You can request a free quote by submitting our online form or calling 1-800-559-SEAL or 1-856-461-1710. APS is one of the Trusted Asphalt Companies in Medford, Moorestown, Burlington Twp, Evesham, Pennsauken, Cinnaminson, Marlton, Mt Laurel, Voorhees, and Cherry Hill, NJ!